Below we’ll cover the most frequently asked questions about accessing your course material. To access your purchases, you must first login. Click here to login now. If you are logged in and don’t see your purchases on the My Account page, you will need to contact support. For instructions on how to log in, watch this quick video! Next, enter your username (sent via email) and the password you entered when you made your purchase. If you have not yet purchased a course on LearnHowToTalkToAnimals.com, you will not be able to create an account with us. To get started and view your recent purchases, got to the My Account page. 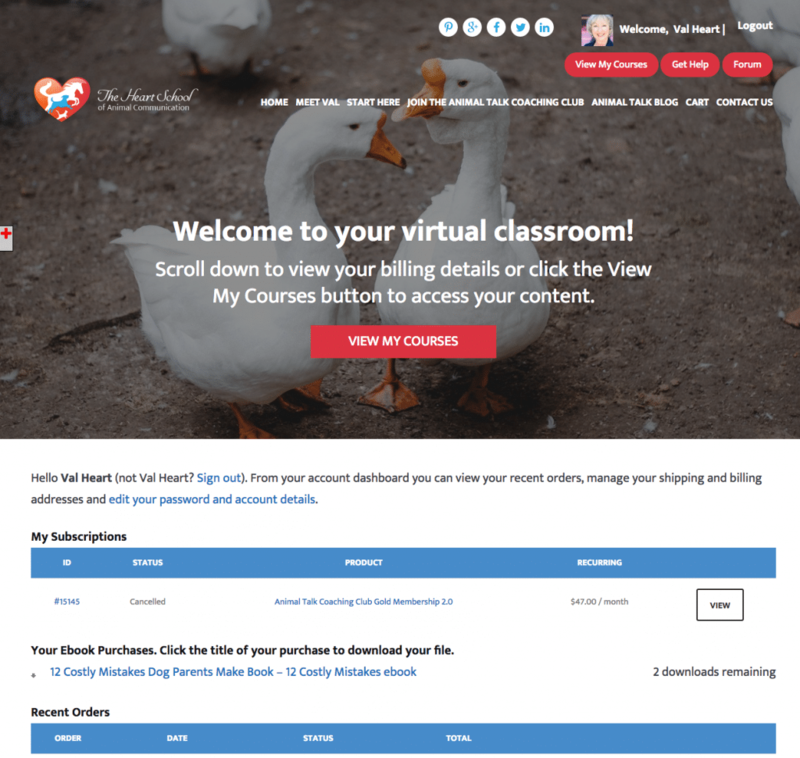 The next step is to access your courses by clicking the red button “My Courses” you can also click here if you are already logged in. 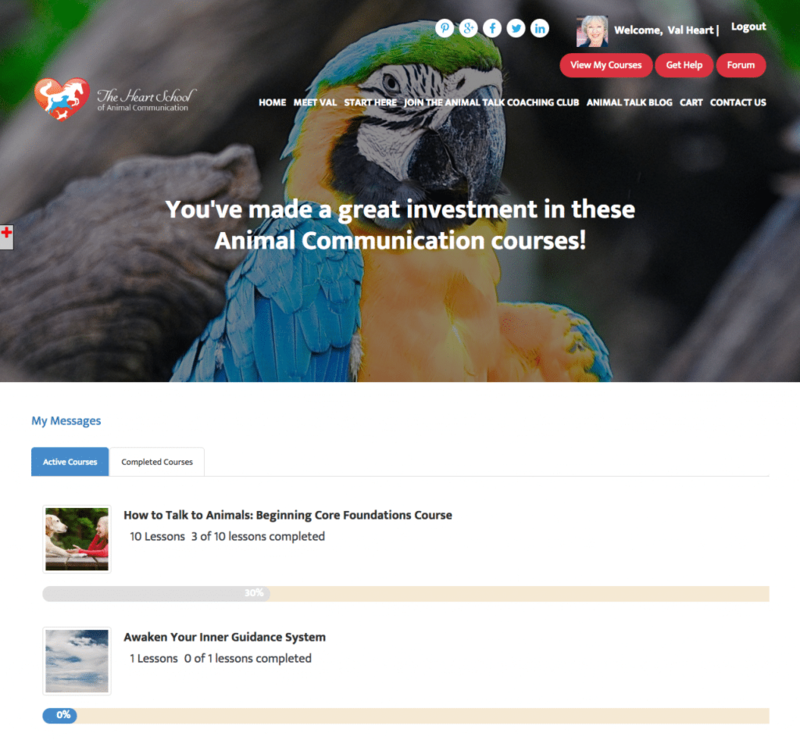 On the My Courses page, you’ll see a list of all the courses you’ve purchased and your progress in completing each course. 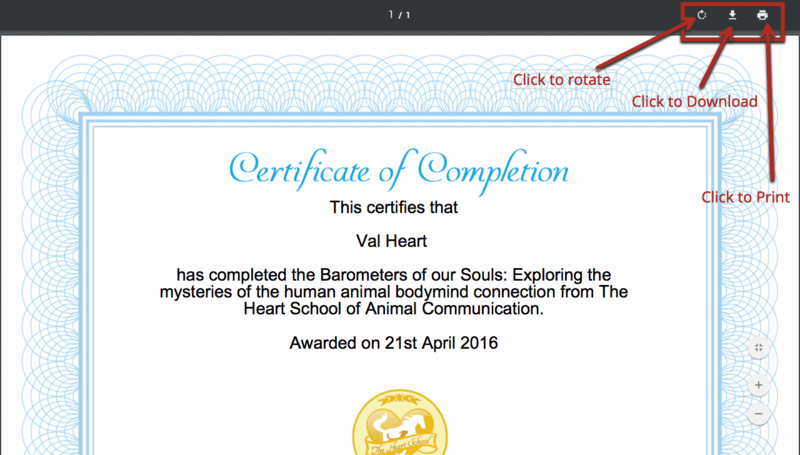 To start a course, click on the name of the course to read the introduction to the course. 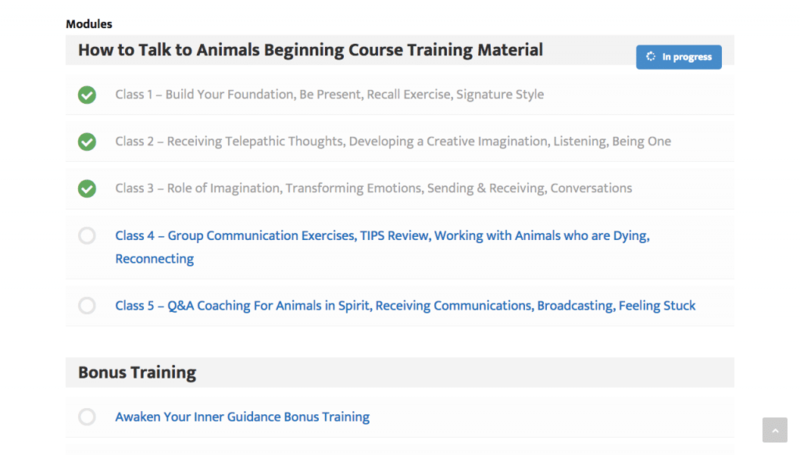 At the bottom of the page, you’ll see a list of modules and lessons. Click on the title of the lesson be taken to that lesson. At the bottom of the course page, you’ll see a list of the modules and lessons. Select the lesson you’d like to learn by clicking on it and you’ll then be taken to that lesson. 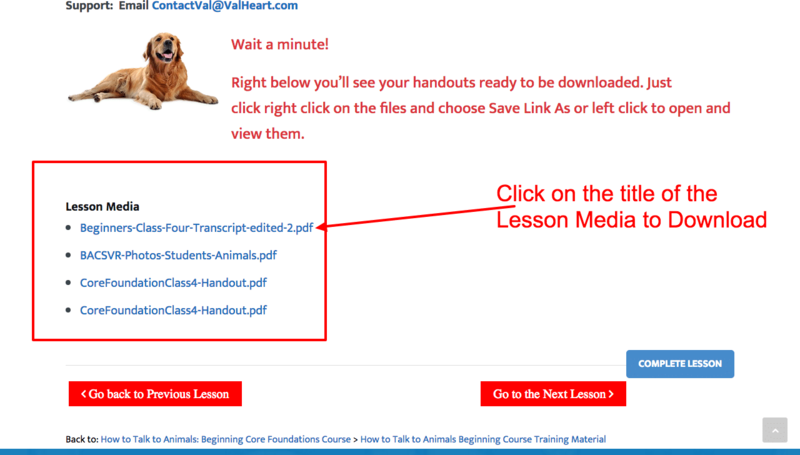 At the bottom of some courses, you’ll see a section called “Lesson Media” here’s where you’ll find all the handouts for your courses. When a lesson is complete, click on Complete Lesson at the bottom of the lesson page to let the system know you’re finished with that training. 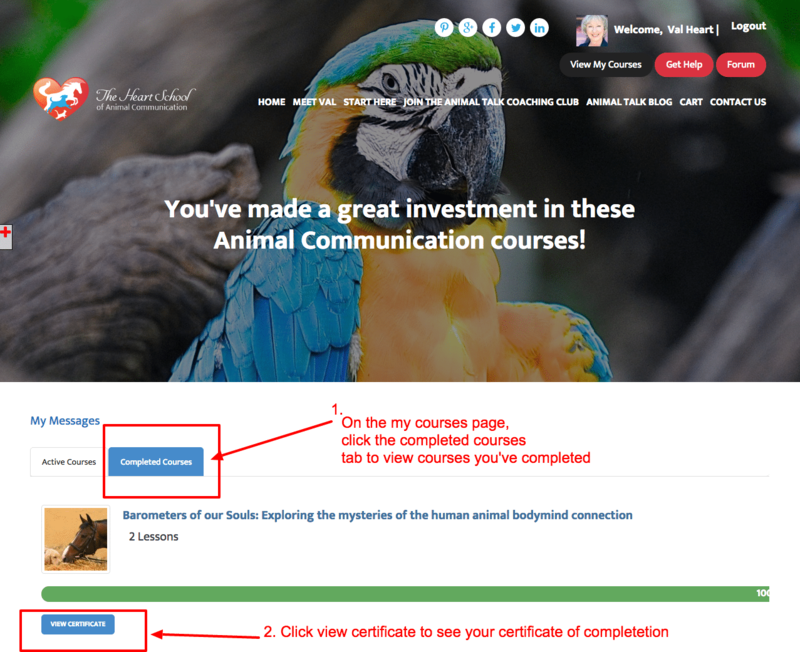 Once an entire course is complete, your course will appear under “Completed Courses”. From there you’ll be able to view and print your certificate of completion. Your certificate of completion is a PDF. You can print or save it. A copy of your certificate remains inside of your account at all times. 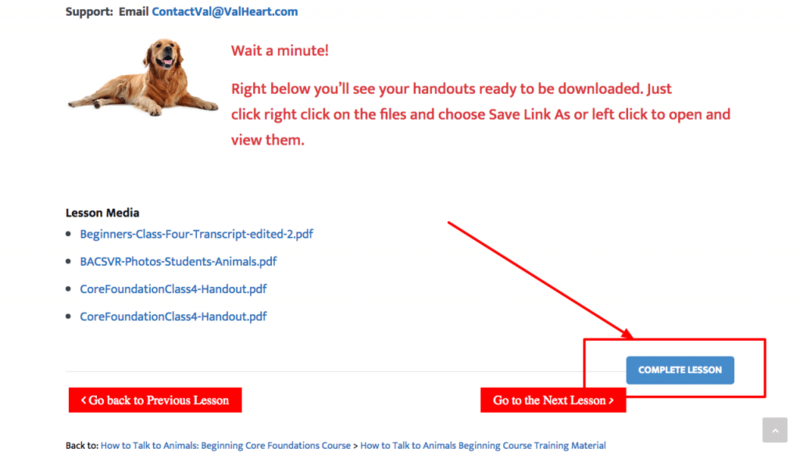 The following video provides instructions for posting in the Animal Talk Coaching Club Forum. 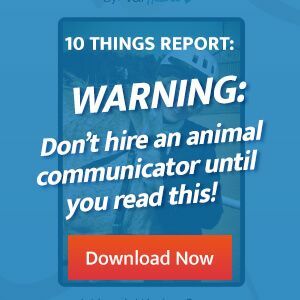 The file size limit for images to be uploaded to LearnHowToTalkToAnimals.com is 300MB, therefore, you may find that some of your images are too large to be uploaded. Y0u can easily resize these images by uploading them to www.picresize.com. The video below provides instructions for resizing your images with this free website.